As Father's Day is approaching, I love the idea of giving the gift of a good apron -to be used in the workshop or around the barbecue. LC King's Pointer Brand, based in Bristol, Tennessee prides itself on quality work clothes that are part of the rural south. LC King Manufacturing is the oldest cut-and-sew factory in the United States that is still owned by its founding family. There's a homespun feel to this factory which invites other designers in to use the space as a workshop. It's truly a gem (and a bit of a secret) here in the south. 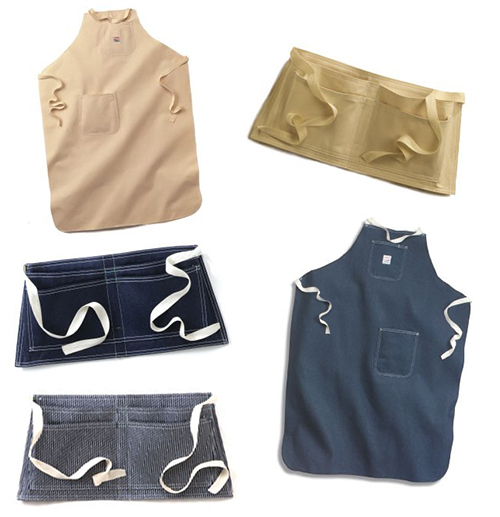 Their popular aprons, made of 100% cotton, have four large front pockets and two pencil pockets. They're one size fits all and machine washable...guys love that kind of practicality. 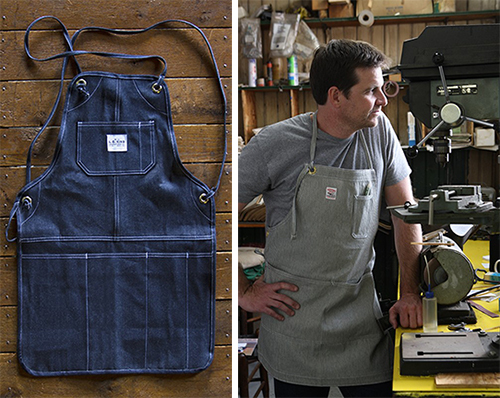 The Pointer Brand shop and waist aprons have a classic workman style. I want to order ten to have on hand for gifts- as I love a gift that lasts, that gets better with age. Check out all of Pointer Brand's apparel which includes jeans, overalls, jackets, shorts, caps, women and kid attire, here. 1. Imogene + Willie Barton Jeans, $250. Eric, These are simply put, the best pair of jeans I have ever owned. 2. Billy Reid Savannah Wingtips, $395. These are great looking dress shoes that go with everything. 3. Pointer Brand Barn Coat, $127. This is a perfect everyday jacket made in Tennessee. Can't beat that. 4. Old Try Prints, $40. They're all great, but we're both suckers for our home state, the Old Dominion. 5. The W & P Cocktail Kit, $279. This kit will help you stock your bar, while the canvas and leather mason bag doubles as the perfect weekend accessory.